Westell offers a robust site security management solution that includes remote monitoring of door alarms, window alarms, web-based cameras, and more. In addition to equipment monitoring, our solution centrally stores camera images and generates motion-triggered events and alarms to automatically notify technicians or loss-prevention personnel to search for and view live or stored footage, enabling speedier issue resolution. An intelligent remote site appliance that monitors network communications, power, surveillance equipment, and other site devices. 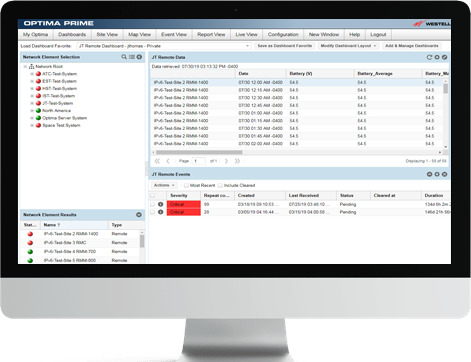 A management system accessed from your operations center, enterprise data center, or mobile laptop computer, which centralizes alarm status and provides complete equipment database and reporting. Optima hosts applications that provide several additional remote site management functions. SecureSite is a cost-effective and continuous site monitoring solution. It enables remote monitoring and storage of videos or snapshots of activity from sites. Images are sent to SecureSite by remote IP cameras. The video motion detection sends images only as needed. The image frequency, bandwidth, and quality are user-selectable depending on the demands of each site.